To rapidly heat steel knives on the line of a food processing facility, improving efficiency; the client had been using a different heating method. The client had been using torches for preheating. However, due to process improvements thanks to new automation in their facility, torch heating became too slow. This resulted in a backlog that kept them from maximizing their throughput. The c-lams are inserts for an automotive industry application. In production the robotic pick-and-place will occur for plastic overmolding after heating by induction. Temperature indicating paint was applied to the parts, and it took 10 seconds to heat the various styles of the part to the targeted temperature. This testing achieved the client's time and quality objectives. Heat a non-magnetic metal alloy shape-setting fixture for a Nitinol wire heating/shaping application. With an EKOHEAT 10 kW power supply, the titanium alloy wire can be heated to 2732 °F (1500 °C) in three seconds. This testing configuration simulates using three EASYHEAT 10 kW power supplies in series. The induction process required 10 minutes to heat to the required temperature; the client's resistance heater took more than ten minutes. Also there will no longer be a need to open the chamber to remove the heater. This is part of an automated line. The system was sized and the coil was designed to ensure 45 parts per minute can be heated to the temperature required for hot forming. Induction heating offers dramatically faster heating compared to ultrasonics which means dramatically increased production rates. Induction is highly repeatable and easy-to-integrate into manufacturing processes. A 2.5 inch steel pipe is heated by induction to the targeted temperature quickly with induction's repeatable process. EKOHEAT is easy to integrate into manufacturing processes and targets only the portion of the tube that requires bending while not heating the remainder of the tube. The grenade was then placed inside the coil and power was turned on. After just two seconds the painted indicated, meaning the part achieved 800 °F (427 °C). Temperature indicating paint was applied to the steel part for testing purposes. The part was then placed into the induction heating coil and the power was turned on. In just under 30 seconds, the part achieved temperature. Induction uniformly heats the large billet and the client's longer 15 foot billets quickly to 1800C. The steel axle was painted with temperature indicating paint and a thermocouple was attached to the part. Testing was conducted to optimize the power delivered to the part. The coil was designed to minimize the voltage potential over the length of the part. Disappointed with low quality levels in a previously outsourced process, the customer uses induction to bring the heat treatment and the control of the end-product quality in-house. This spray painting application requires pre-heating the material. Additionally, there is a requirement that the material must not cool below a certain target temperature prior to the spray. A need to increase volume and quality of parts production led to the choice of an induction process over flame. Handling is minimized and continuity is assured with the precision delivery of heating only where required. An eight turn helical coil is used to heat the vials. 0.0625 thick insulation is wrapped around the vial and the vial is placed in the coil. The optical temperature probe is inserted into the vial with the base of the probe located in the middle of the coil turns. A four turn helical pancake coil is used to heat the anode. The area on the anode to be preheated is the weld between the tube and flange. A twenty turn helical coil is used to heat the chain. The chain is fed through the coil at a rate of 1 meter per minute to reach the desired 1760 °F (960 °C) for the tempering process. A fifteen turn helical coil with ceramic insert is used to preheat the 15 (381 mm) section of steel bar stock. A nine turn Dog Bone style coil is used for the flow-melting process. The tin coated carbon steel plate is placed in the coil for 1.34 seconds to uniformly reflow the tin coating. A single turn helical coil is used for this heating application. The lead terminal is placed inside the coil and is heated for 20 seconds. A two turn helical coil is used for heating. Six graphite susceptors are placed in the nitrogen atmosphere with glass discs and a stainless steel holder. 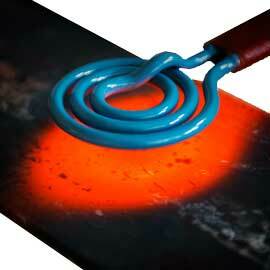 Induction heating provides hands-free heating that involves no operator skill for manufacturing. A multi-position coil provides simultaneous heating for quicker production times. A three turn helical coil is used to heat the discs to 1400 °F (760°C). A four turn helical coil is used to heat the vial for 30 second intervals for five minutes with a temperature reading taken at each interval. Induction pre-heating prevents shock to shaft which eliminates cracking in the welding phase. Hands-free heating that involves no operator skill for manufacturing. A four-turn helical coil is used to heat the assembly for five minutes. This provides slow, even heat for good penetration through the shell into the powder. Energy is applied directly to the springs only; surrounding air and fixturing are not heated. Precise direct heat to disengage the aluminium quickly and cleanly. The aluminium casing is recycled and reused thereby reducing scrap and cutting costs. Heat steel plates on conveyor system in order to cook Welsh cakes. Precisely heating the desired zone avoids overheating of part. This provides higher quality vs. heating with a torch. Induction heating is safer than heating with a convection oven. Grease from the molds causes a fire hazard and waste gases in the oven. The coil is comprised of two (2) six-position helical coils connected together in parallel to reduce the voltage requirements on the power supply. Induction heating provides a much more rapid process compared to cold-rolling; the desired profile is achieved after a few seconds, compared with a few minutes. An eight turn helical coil is used to generate the desired heat pattern. The coil has a 0.62 ID. An individual wire is inserted and heated to burn off the varnish for 5 seconds. To reach a temperature of around 300 F requires a minimal amount of power. The Ambrell system heats the fixture to the set point at the rates specified and the Nitinol wire is shaped as desired within 4 minutes, using less energy and time than traditional oven heating methods. Heat eight steel rods simultaneously to 212°F (100°C) for a molding operation. To heat the face of an engine valve head to 900°F and maintain the temperature for an extended time, high temperature stress test. 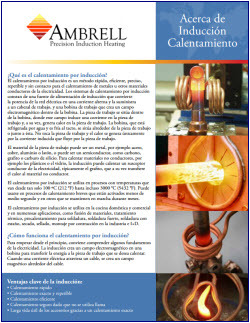 A specially designed thirteen-turn helical induction coil is used to heat the titanium rod to 1700ºF (926.7°C). Heat a titanium blade to 500°F (200°C) to melt and drain the wax from inside the blade. Heat a jet engine fuel nozzle to 1400°F (760°C) in order to decarburize it. Heat a steel die to 975°F (523.8ºC) to set (cure) a shape memory alloy nitinol in the correct position. Esta sección del libro de notas de aplicaciones contiene aplicaciones generales de calentamiento que no encajan en las otras categorías de procesos. Existen numerosas aplicaciones de calentamiento de precisión en las cuales sólo es necesario calentar una parte de la pieza para poder realizar la operación correcta; entre los informes específicos contenidos en esta sección de nuestra base de datos se encuentran técnicas de calentamiento para nitinol, varillas de fibra de carbono, alambre delgado de cobre, cabezas de válvula y otros materiales. Un sistema típico de calentamiento por inducción incluye la fuente de alimentación, la unidad de trabajo y la bobina inductiva. En el calentamiento por inducción una fuente de alimentación convierte la potencia de línea de corriente alterna en corriente alterna de mayor frecuencia y lo transmite a la bobina de trabajo creando así un campo electromagnético dentro de la bobina. Su pieza de trabajo se coloca en el campo que induce corrientes de Eddy en la pieza. La fricción producida en este proceso genera un calor preciso, limpio y sin contacto. Por lo general, se requiere un sistema de enfriamiento por agua para enfriar la bobina de trabajo y el sistema por inducción.